At last, an amazingly simple and very economical way in which to mark and number your beehives! It’s easy to be compliant with beehive management requirements. Purchase a kit comprising of a self-inking rubber stamp made up with your unique number, spare bottles of fast drying ink and an instruction sheet. As per regulations to do with American Foulbrood (AFB) Disease, all apiaries must be marked with the Beekeeper’s Registration Code*. Our Beekeeper Stamps provide a quick and easy way to do this while keeping the cost low. Source: *’AFB Beekeeping and The Law’ See Item 6. Our Stamps and fast drying inks are non -toxic, alcohol free & quick drying. The stamp is lightweight but sturdy and is easy to refill. The special ink has exceptional light fastness and the entire process is amazingly economical too. Steps and processes to get your “beekeepers’ hive marking kit”. Can expect your kit to be made up and dispatched within 2 days of order completion. Quick tip: Please ensure that the surface and target area is clean and dry before stamping your number. Some more resources and alternative methods to get your beehive number permanently marked. 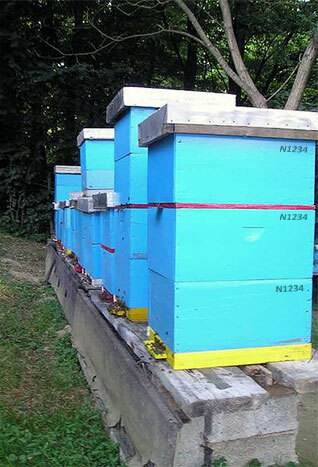 It does not have to be difficult or costly to get your beehives numbered quickly and effectively. You don’t need heavy equipment and don’t even need to remove hives to be marked in a workshop; you can simply mark them in situ. Purchase your ‘beekeeper hive marking kit’ from Stamps Plus for guaranteed quality and after sales service.